The Porcupine Creek Trailhead is located along Tioga Road roughly 1 mile east of the Porcupine Flat Campground and 4.5 miles west of Olmsted Point. (Roadside parking is located on the south side of the road.) Note that while this trailhead is accessible after Tioga Road opens, the trail itself may still be covered in snow and difficult to navigate early in the season. Check conditions with rangers if you are unsure. 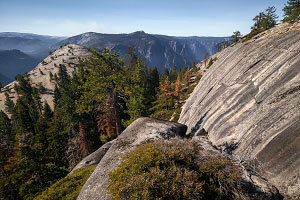 The trail continues south following the ridgeline and soon enough, forest gives way to bare open granite, offering views of Half Dome and Yosemite Valley in the distance. North Dome can be seen prominently one mound a way. At one point, the official trail hooks to the left into the woods, but you can just as easily hike down the face of the ridge. (See map.) At the next trail junction with the trail to Upper Yosemite Fall, the trail to North Dome takes a hard left and zigzags down into the forested gully under Indian Ridge and then heads up the spine of North Dome proper. 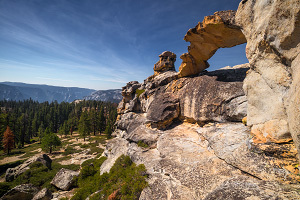 From the top of North Dome, you can see amazing views in all directions; the straight-on face view of Half Dome is particularly striking as is the view into Tenaya Canyon under Clouds Rest. When you have had your fill, return the way you came and remember that the return trip to the Porcupine Creek Trailhead will be a bit more strenuous as it is 600 feet higher. On the return hike if you have enough time and gas in the tank, take the short spur trail up to see Indian Arch, a beautiful and rare granite arch formation. And if you have even more time (roughly an hour), you can continue hiking the ridgeline north to the highpoint labeled "Indian Rock." A bit of route-finding and scrambling are necessary, but the views from the top of this remote little peak are worth it. Return the way you came. Note: While viewing the map, click on the map to return to this page. 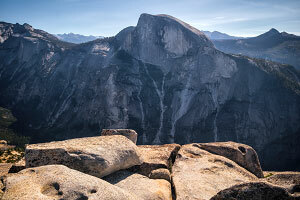 This is a great day hike in Yosemite's backcountry and the views from North Dome are some of the best in the park. While this route is somewhat popular and you will run into a fair amount of people along the trail, the strenuousness and remoteness of the hike should keep it from feeling overly crowded.